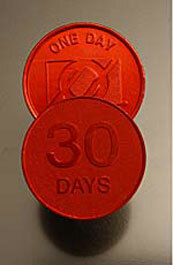 Engraved Medallion – 3 Years, OA Logo “One Day at a Time” on one side, “OA Promise” on the reverse, bright silver-coloured finish. 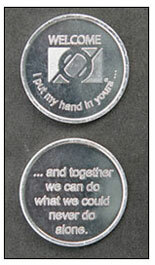 Engraved Medallion – 4 Years, OA Logo “One Day at a Time” on one side, “OA Promise” on the reverse, bright silver-coloured finish. Remind newcomers they are not alone. OA logo, “Welcome” and part of the first sentence of the OA promise “I Put My Hand in Yours” on one side, and the sentence continued on the other.